Two people are dead and more than 120 injured, some critically, after a massive pile-up today involving at least 100 vehicles that left trucks twisted on top of each other and authorities rushing to pull survivors from the miles of wreckage. The Thanksgiving Day collision happened around 8 a.m. on Interstate 10 southwest of Beaumont, a Gulf Coast city about 80 miles east of Houston. Extremely dense fog blanketing a section of the Texas interstate made conditions treacherous for drivers heading to Thanksgiving holiday feasts. Officials at Acadian Ambulance service said more than 50 people have been taken to area hospitals in Beaumont, Port Arthur and Winnie. At least eight are critically hurt. Multiple ambulance crews responded and transported patients to area hospitals. Baptist Beaumont Hospital spokeswoman Mary Poole told KFDM News they’ve received at least 21 patients. One was in critical condition. They’ve transported two children and one adult with head injuries to a Houston hospital. It wasn’t immediately clear how the pileup began, but Jefferson County Sheriff’s Office Deputy Rod Carroll said the fog was so thick that deputies didn’t immediately realize they were dealing with multiple accidents. The westbound lane of the interstate has been reopened, he said. “We have 18-wheelers on top of cars, we have cars on top of cars. It’s just catastrophic,” he said, adding that rescuers were still looking for victims. He said the initial accidents took place separately about a mile apart on the east- and westbound sides of the interstate. The highway had been crowded with motorists traveling during the Thanksgiving holiday. Many of the vehicles were moving close to the posted speed of 70 mph despite dense fog that limited visibility, Rod Carroll said. 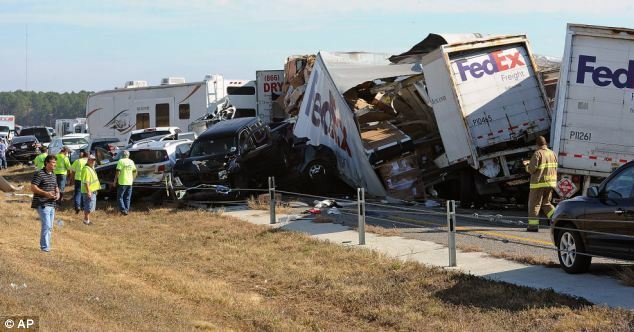 Chief Charles Sonnier of the Labelle-Fannett Volunteer Fire Department told KFDM News the vehicles involved in the accidents include seven tractor trailers that collided on the eastbound side. Two were carrying hazardous materials, but they aren’t leaking, according to Charles Sonnier. Charles Sonnier added that firefighters had to use the jaws of life to cut people out of a car and pickup truck. I-10’s eastbound lanes were expected to remain closed for most of Thursday. Ron Carroll said uninjured drivers tried to help as authorities sorted through the wreckage. “It’s just people helping people,” Ron Carroll said.